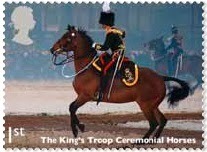 The second Royal Mail stamp issue of 2014 shows Working Horses. 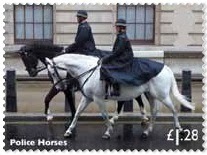 This set salutes the contribution horses still make to working life in the UK, from the ceremonial horses of the Kings Troop to Police Horses and horses used in environmentally-sensitive locations for forestry. 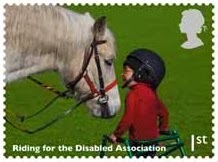 One 1st Class stamps celebrate the work of the Riding for the Disabled Association, which provides therapy and enjoyment to almost 30,000 people a year. The other shows ceremonial horses of the Kings Troop. 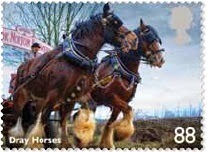 The 88p stamps show Dray Horses pulling a dray from Hook Norton Brewery and Royal Mews Carriage Horses. 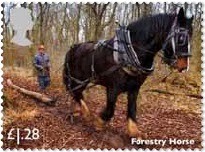 The £1.28 stamps show a pair of police horses, and a forestry horse. 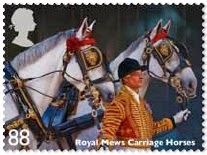 Very attractive set which compliments the many other Horse sets of stamps Royal Mail have issued since 1978. It now seems that sets of six stamps are the minimum, whereas in the past three or four stamps were deemed enough to tell the story. Why is this set really being issued? Is it to appeal to the Chinese philatelic market since next year is the Year of The Horse? Wow this set is beautiful, they remind me of the Working Dogs stamp set, as they are in the same vein. That'll be a nice issue for me to stock up on for postage!